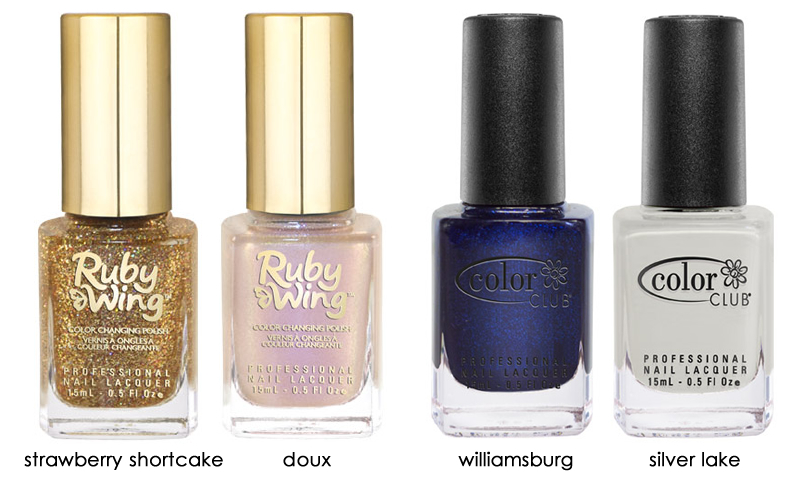 Ruby Wing Cupcakes and Champagne Collection Swatches, Review and GIVEAWAY! I'm excited to show you swatches of the Fall 2013 Scented Cupcakes and Champagne Collection! If you're not familiar with Ruby Wing polishes, they use SolarActive technology to change color in UV light. Four of these are quite sheer and, in my opinion, work best as toppers. I initially experimented with layering the polish over other Ruby Wing color changing polishes. While it worked, I decided it was too many changes at once and it sort of defeated the purpose of swatching! So instead, I layered each polish over a complementary color from the Color Club Girl About Town Collection. They made perfect color combinations! In each case, you can click the Color Club polish name to see my swatch of that base polish alone. I'll start with my absolute favorite, Strawberry Shortcake. 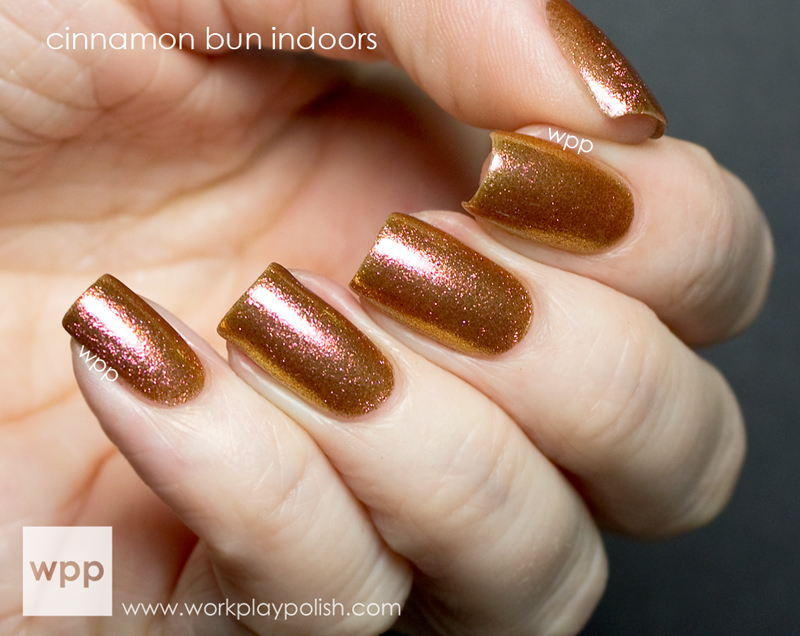 This may be one of my top three gold glitters ever...even without the color change! 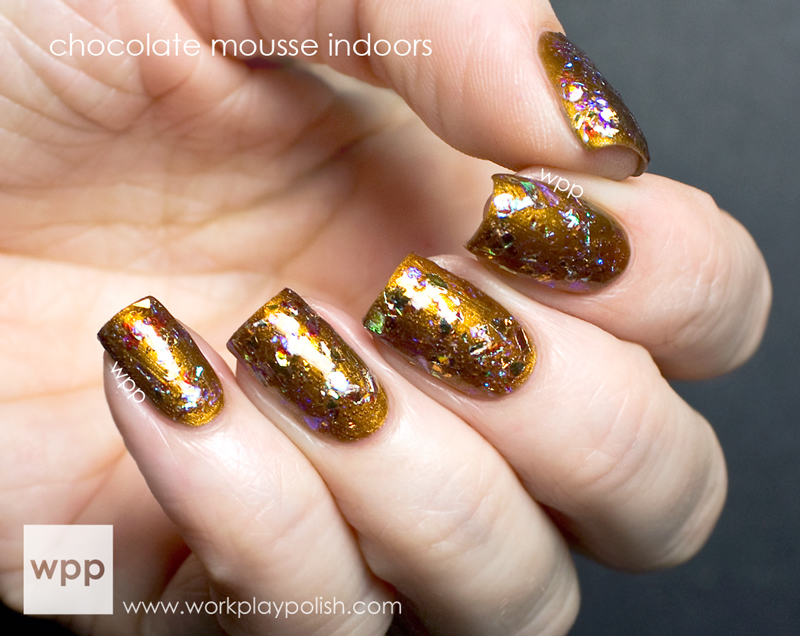 The fine glitter is holographic gold and sprinkled with strawberry pink (GAH!). Under UV light, it darkens to an almost strawberry red shade. (My pic was taken after some of the color change had faded.) I'm showing you only two coats with no undies. Not only is this one super sparkly, but it actually smells like Strawberry Shortcake (the doll, not the dessert. LOL). Rose is a soft, glittery pink. I layered it over two coats of Color Club Silver Lake. It changes to a beautiful berry shade! I was so amazed by this one. Sweet Cream is a sheer, pink-toned opalescent glitter polish that turns to a medium pink. The glitter has a great consistency. In my swatch it looks more coral because I've layered Sweet Cream over two coats of Color Club East Austin. Chocolate Mousse is a strange bird. It's a clear base with large pieces of soft shredded opalescent flakies. Initially, I had trouble with application. But once I embraced it as a textured polish (instead of unsuccessfully trying to get it smooth)...it totally made sense. The thing to keep in mind if you're using it over colored "undies" is that the clear base is what changes into a chocolate brown. 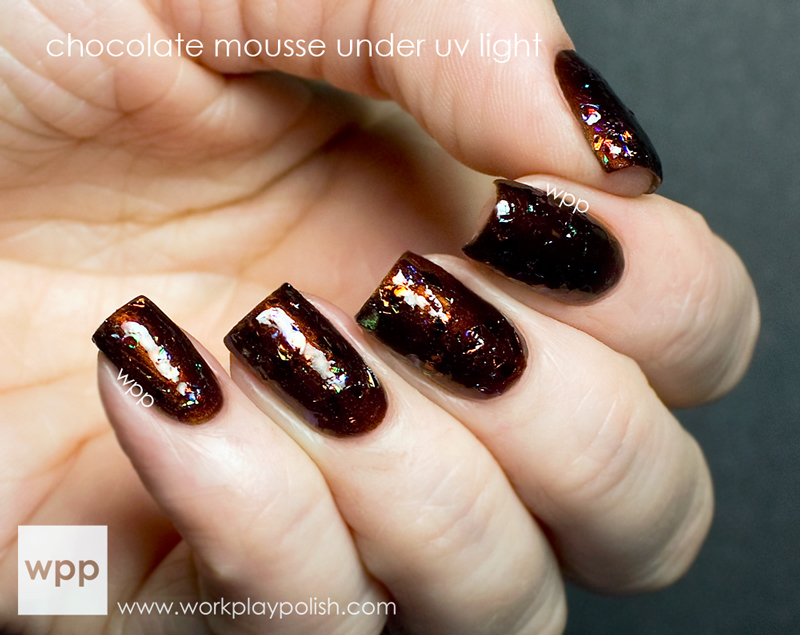 When applying it, first focus on ensuring your base color is completely covered in the clear base of Chocolate Mousse. 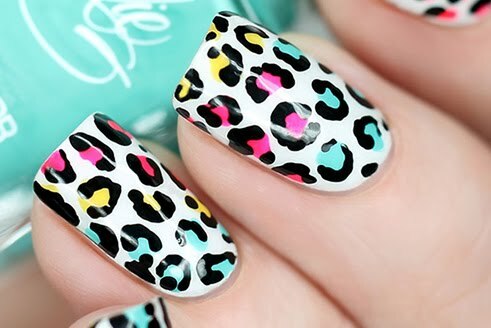 Otherwise, you'll have areas around the cuticle and edges that won't change color. 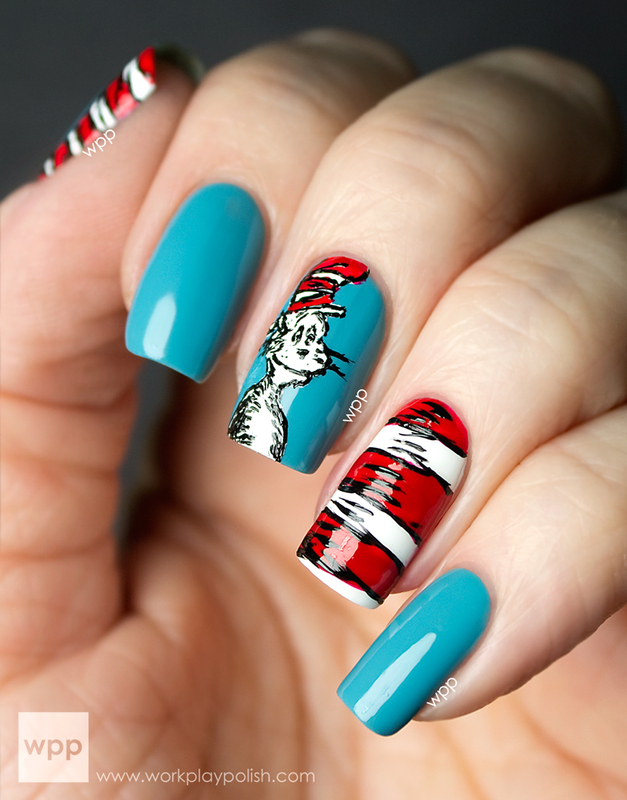 Then go back in and dab the shredded glitter over the nail. I layered this one over two coats of Color Club Pearl District. 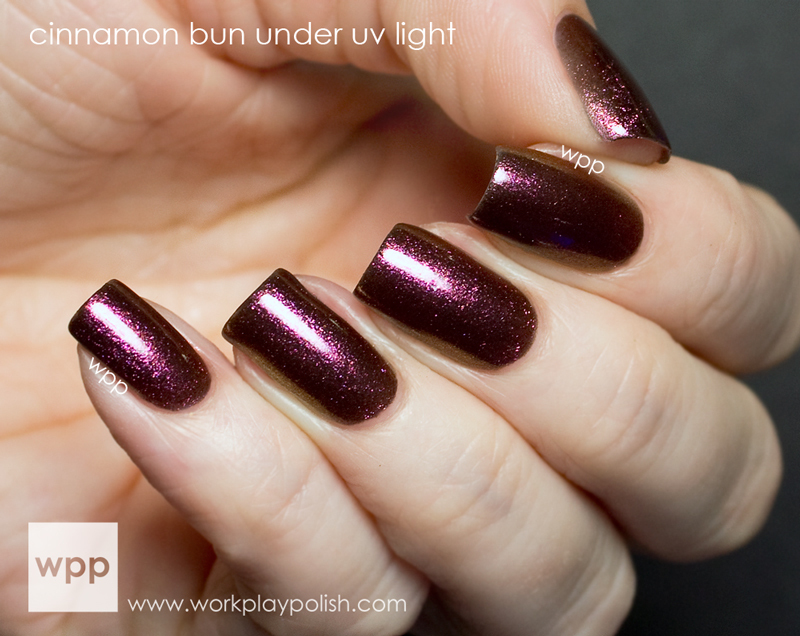 Cinnamon Bun is a rusty duochrome foil that changes to a dark purple-ish cinnamon shade. My swatch is three coats. I kept catching very subtle whiffs of cinnamon while wearing this! And finally we have Doux. Doux is the French word for sweet and Champagne Doux is a term that refers to the very sweetest champagnes. This is a close second favorite for me. I love this one equally in and out of the light. It's a purple leaning iridescent glitter. The change is dramatic. It turns to a deep purple. I used two coats over Color Club Wicker Park. Doux has the same great consistency as Sweet Cream. It's a great topper even without the color change. The scent is sugary. With the exception of Chocolate Mousse which was a little tricky, the polishes in the collection have a smooth, easy formula that was easy to apply. I'm not a huge fan of scented polishes, but the smell isn't overwhelming. The theme here is so clever and hard to resist, so I get the smell and think these are a lot of fun. Swatches were photographed under my indoor lamp and again after exposure to a blacklight. All swatches use G&G HK Girl Topcoat which didn't impact the color changing results. Ruby Wing retails for $10USD for a 15ml bottle. You can purchase them online at the Ruby Wing or SolarActive websites. 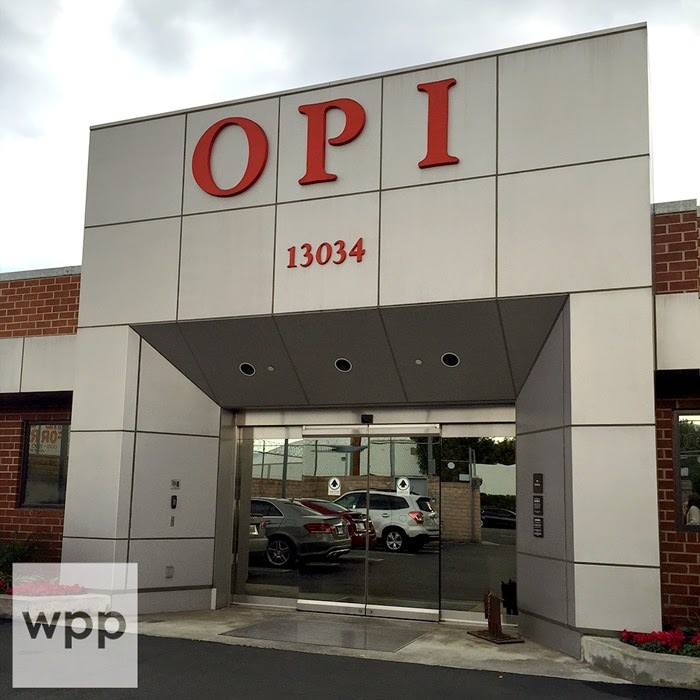 Sign up for their newsletter and follow them on Facebook and Twitter for product news and promotions. And now it's time for quick giveaway! Forsythe Cosmetics provided me with a pair of colors from the Ruby Wing Cupcakes and Champagne Collection AND the Color Club Girl About Town Collection. One winner will get all four! This giveaway is open to residents of the US and Canada. You may enter internationally if you can provide me with a US address for delivery. Please read the official rules. Contest opens at 12am EST on 8/19 and closes 9/2. Good luck!